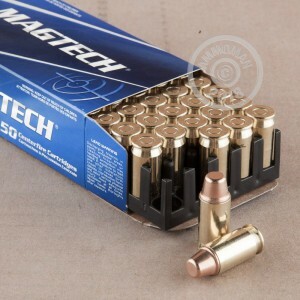 Enjoy your .45 Auto pistol on the range with this quality target and training round from Magtech. Training and practice are essential whether using firearms for self-defense or competitions, and this round is an excellent choice. This is 45 ACP 230 grain Full Metal Case Semi-Wadcutter Ammo. Each of these 50 rounds feature a Semi-Wadcutter projectile, reloadable brass case, and fire at 837 feet per second. This ammo is new production, boxer primed, and non-corrosive. Magtech offers quality, reliability and value in all of their ammunition. Pick up a few boxes to take advantage of AmmoMan's free shipping on orders over $99!